If you have ever wanted to create an interactive timeline for your students to use and reference, TimeToast might be for you. This free online app allows you to easily create and share your timeline data. 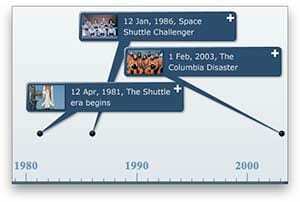 Once the timeline has been created, students can click on a data to see the significance of that event. If they click the more info (+) button, the listing will expand to reveal photos or any other additional information you have provided. This entry was posted in Uncategorized and tagged dates, event, learning, students, timeline, TimeToast, web 2.0. Bookmark the permalink.